Jetzt Angebot anfordern! / Request for offer! Anrede / TitleHerr / Mr.Frau / Mrs. Which pallets are in the open Europallet - pool exchangeable? For reusable pallets are applied the requirements described in the construction standard DIN EN 13698-1: 2003. In addition, further criteria for new pallets were agreed in the type description according to GS1 Asset Type 99993 from 2014. WORLD pallets are confirmed by the standard as well as by the type description of the GS1. How the approved pallets can be recognized? On the logo of the pallet by the recognized pallet organization. New pallets may only be manufactured by a licensed pallet manufacturer. The corresponding declarations of conformity have been verified in GS 1. Falkenhahn AG is a licensed manufacturer of WORLD pallets in Europe. The WORLD Europallet is an execution of the type description. How has WORLD proved the accordance? WORLD has submitted to GS 1 the appropriate declarations of conformity. The WORLD Europallet thus meets the requirements of the Type description. By assigning a type number, conformity is recognized. How is ensured the compliance of the requirements and criteria for exchangeability? In addition to self-monitoring, the type description also requires mandatory third-party monitoring of the manufacturing process. WORLD pallets are manufactured with 100% quality control and third party audit by the SGS. Falkenhahn AG is certified according to DIN EN ISO 9001: 2015. Do the pallets according to the type description also comply with the product safety laws? The Europallets are considered as applicable for use in case they conform to BGR 234 / ProdSG. Only such prepared and tested pallets also correspond to the Type description. New WORLD pallets are 100% tested during manufacturing and therefore correspond the type description. Who has agreed these requirements and criteria for the ability of Exchange in the type description of the GS1? The type description was developed and adopted on the neutral platform of GS1 specialist groups with well-known companies from industry, trade and service providers. Which are the criteria for the accepted pallet organizations? usability of pallets according to classification (pallet poster) and market acceptance through exchange partners. All four criteria are met by WORLD pallets and Falkenhahn AG. At which marking do you recognize pallets of the brand WORLD? According to the type description, the manufacturer identification is on the center block, brand logos are burned on the corner blocks on both long sides. New WORLD pallets have four WORLD logos. They represent GS 1 approved conformity with the applicable type description. Does the type description apply to different pallet brands? The type description from 10.6.2016 is the basis for all Europallet brands. Are WORLD pallets accepted by exchange partners in the market? Many well-known large corporations and medium-sized companies value their quality and value for money. 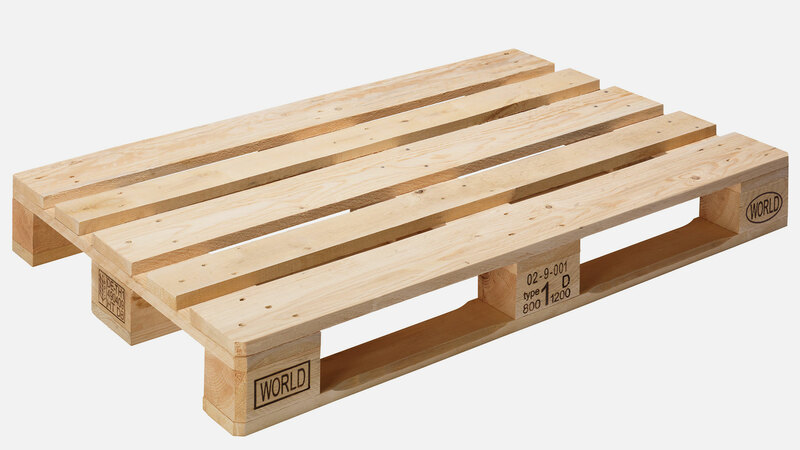 Many millions of WORLD europallets have been sold in Germany and throughout Europe over the past 10 years. They are used in daily logistics. Which rules apply in the exchange pool? In the open exchange pool all new and used Europallets are exchangeable, which correspond to the type description. The quality classification of the pallets is based on the corresponding GS1 poster. Otherwise, are valid the bilateral agreements between sender and recipient of the pallets.